The time has come for all Grab and e-hailing drivers to undergo the Public Service Vehicle (PSV) course and get the PSV license, as required for taxi drivers. The period to comply is from January to July 2019, transport minister Anthony Loke said, reported by Bernama. “E-hailing regulations have been gazetted. Registration of drivers will held from January to July 2019. After July 12 2019, we will start enforcing the new regulations as all e-hailing drivers must have PSV registration and licence and insurance. Vehicles which are more than three years old will be required to undergo inspection,” he said yesterday. This is part of the government’s move to regulate the e-hailing industry and create a level playing field with taxis. Taxi groups have long complained about the ease of which one can be an e-hailing driver, with no need to comply to the regulations that they are subject to. Earlier yesterday, Loke met with Big Blue Taxi adviser Datuk Shamsubahrin Ismail (above right) – one of the most vocal individuals championing taxi rights – at parliament to discuss issues. Loke also advised e-hailing drivers to not wait till the last minute to register for their PSV licence. He also welcomed more e-hailing operators. “It is open to any company. We do not want only one company to monopolise e-hailing service. If there are more players in the market, it would give rise healthy competition and benefit consumers,” he said. Stupid Minister! Where is the regulations for Taxi that not using Meter, Scrap Taxi that still on the road and so on? Smart minister! So then Grab is just another taxi operator. Level playing field with Blue Cab and others. Agreed, what pm told him to be equal he just follow like dumb fool without looking issues grab and taxi are facing. no work has been done by him on this matter. he shouldve fixed the problem with regards to the matter of taxi not using meter,waiting,going by looking at the conditions of the road and other issues. Driving a personal car as for ehailing shouldnt be treated as same as taxi. Technology has evolved. Syabas YB Anthony!! Bersih dan saksama. lol! Taxi lobby has won. This is the beginning of the end for rideshares here. Subsidi dan bantuan pisah tiada.. But Big Blue Dr Evil doesn’t have a need for that subsidi nor bantuan. No subsidy here but only protecting his cronies. lol! Customer has won. This is the beginning of the end for bad taxis. Expect smart minister to announce compulsory features to taxis that customers have enjoyed from ehailing..
after July 2019, a lot of Grab drivers will stop driving. Grab will need to do something to retain their drivers. 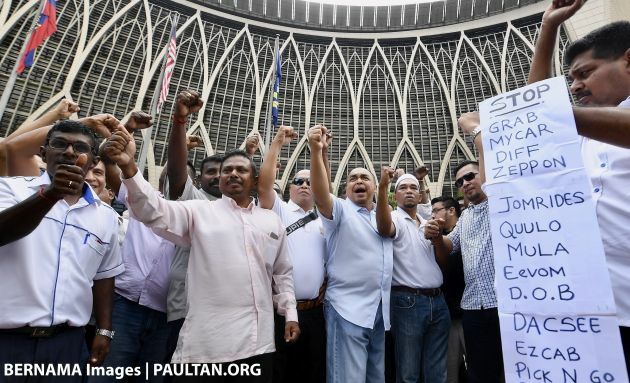 if all the cost is borne by the drivers yet they have to work 12 to 13 hours a day just to earn a nett income of RM4K with the additional cost to meet this regulations, Grab will suffer and drivers will have to look for alternative jobs. All these requirements for our Grab drivers is because the lazy teksi drivers are making so much of noise, threats and walkouts. Jealousy is the No 1 cause here. All the lazy teksi drivers dengki the Grab so much until the Government has no choice but to impose all these on Grab drivers. Hello teksi drivers, you guys are so lazy. All the time want to be pampered and want bantuan all the time. Typical Putrajaya mentality. Try to work hard and if can, go join Grab. Nobody is stopping you from joining Grab. Why must you be jealous? Go join Grab and make money like the Grab drivers. Don’t just lepak bawah pokok and sembang with other teksi drivers for hours. All the time smoking under the tree, chit chatting and looking at girls. Be like the NTUC drivers in Singapore. They work non stop. 12 hours non stop they are driving looking for passengers. You are lazy, how you expect money to come to you? If you spend like 6 hours in the day sleeping under the tree, smoking non stop inside a parked teksi……of course money won’t come to you. Pity Grab drivers now subject to all sorts of regulations and fees just because teksi guys are jealous. Grab and Uber gave the rakyat clean, not smelly teksis and honest system. We the rakyat got fed up with cheating teksi drivers. Even I myself have been asked to pay RM300 for a ride from KL Sentral to KLCC which took a mere 10 minutes. Rakyat got fed up with all these cheating. Then refuse to use meter. Those who use meter also, 9 out of 10 meters got gadget inside that can make the meter move faster. When JPJ want to inspect, then they remove the gadget, thus no detection. We have had enough of cheating by the teksi abang abang. Oh yeah, don’t forget about the huge number of dirty teksi drivers who talk dirty to women and try to peep into their skirts when they collect money. Looks like Big Blue will flourish once more. Congrats voters, you have chosen this. Having Grab drivers take PSV licence & insurance would increase their costs to the point that it turns them unattractive. When it becomes unattractive, then drivers would stop. So when the drivers stop, supply would be constricted & now you have to rely on the expensive taxis. So what’s the bloody point of having e-hailing services again? That wasnt the point. The point was to restrict Grab until its business dies a slow death, then the teksis rules supreme once more. This is their reward to the teksimen that had actively campaign for PH that time. Yes I agree to this comment. Part time drivers will feel the pinch and might stop driving. How much do Grab pay for drivers…end of ehailing service. Customers..sorry you have to sit in smelly and improper condition taxis again. Good luck. May be vote for Najib again..Uber will be back. How abt making it compulsory for taxi to adopt similar app like e hailing company so public can rate their service…that is if public ever uses them. All taxi drivers MUST be on e-hailing app to avoid overcharging passengers and auto assign to destinations without them being picky!! Yes have to agree with you. There must be insurance. I avoid taking Grab just because of that. Imagine if i got into an accident, how hectic will the insurance claim process be. I for one salute this action to get PSV license. Shame on those whining about increased prices. Hello? Can u even predict the future? Amazing how the opposition govt. trolls are trolling on this website. Heavy on the other side now. Taxi strike scare G. As Grab user or driver pretty sad with new G. Sooner will increase price. Now all these ehailing requirements are the same as on taxis , then what. Taxi drivers will be happier and all the passengers are coming n running back to taxis services la?please help me here, really confused or maybe im just stupid to understand. Is not even a solution. U are making things complicated. Grab drivers also currently are under tremendous difficulties and hardships with new regulation by grab company. And Become more painful with this new requirements by our government. Not a surprise, not many people are Willing to drive ehailing services anymore in the near future. Bad for rakyat. Cars older then 3 years need to go for inspection. But, after that? Do taxi’s get a yearly inspection? Most taxi’s on the road are a safety hazard. And by that I don’t mean the driving ;). Substances in use again? Why go after Grab drivers? Who is setting the rules here? Clearly, Grab the company is king. Drivers are slaves to Grab and now the minister also wants to make them the government slaves? Go after GRAB (THE COMPANY) for exploitation, regulatory abuse, unethical business practices, monopolistic practices NOW! Those complaining are mostly grab drivers. As a consumer, I have no complain since I can still take my grab as usual with the benefit of insurance coverage. the best is, gov also have to stricten some rules to taxis. eg set a higher standard in car used as a taxi (in dubai, most of the taxis are camry), car age limitation,yearly inspection, service rating based system, improvised the taxi meter which cant be tempered and make it mandatory to all, reduce or review back all the subsidies given so that “level-playing games” environments really can be established.